Quick & easy dinners are an ever constant popular topic of discussion. People are busy. In a perfect world we would all have time to make a “from scratch” dinner each & every night – but then it’s back to the real world. Life, kids, work, housework, schedules, practices, appointments, social lives – there will never be enough hours in a day. The thing is – people want to eat at home again. They want to make their own food & cook, they want to know what’s going into their food, they want a nutritious meal, they want to sit down at the table with their family and they don’t want to spend a ton of time & money doing it. I love making my red sauce from scratch, but I don’t always have the time to do it. I have absolutely no shame in taking shortcuts when need be. A good sauce from a jar…? Yup. I’d much rather get a quick & delicious meal on the table using jarred sauce than feed my family fast food or greasy diner food. 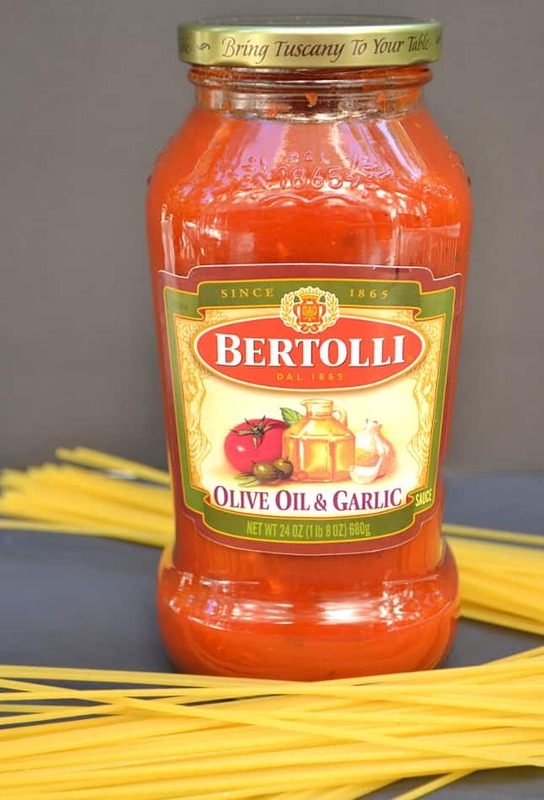 I’ve shared my enthusiasm for Bertolli sauces before. You’ll find an array of quality sauces for a reasonable price. 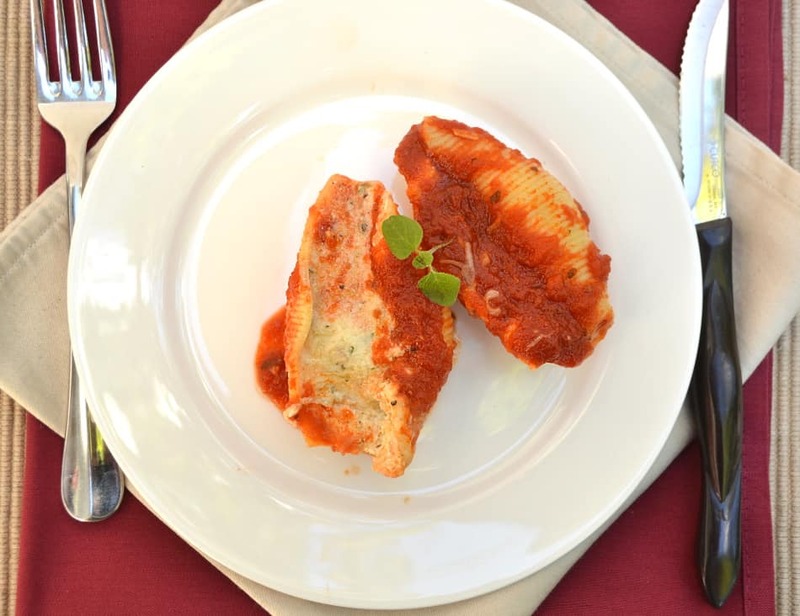 The 150 year old Bertolli tradition values a simple, uncomplicated way of cooking, the Tuscan Way. The sauces focus on a few simple key ingredients and a touch of olive oil. These sauces are cooked lightly and you’ll find them to have a brighter color and a fresher & bolder flavor. 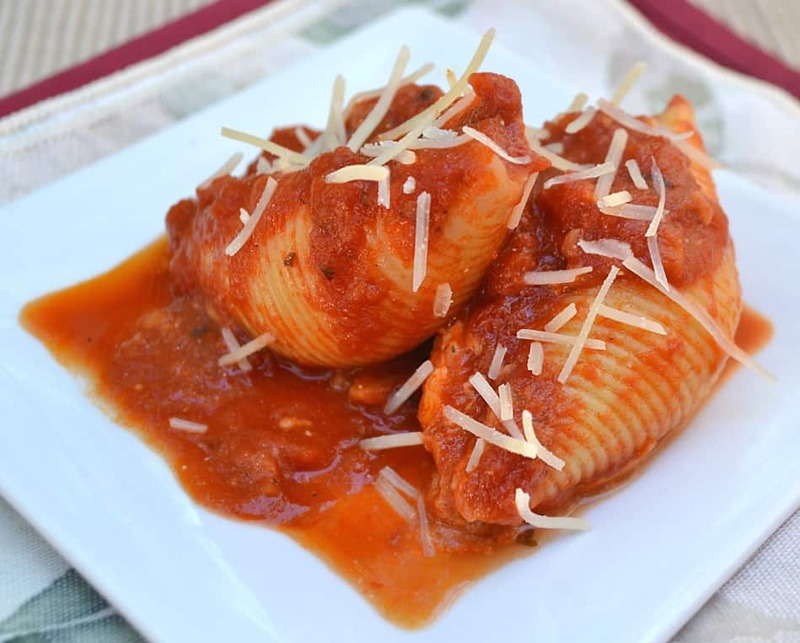 These stuffed shells are quick to make and can easily be changed up to suit your family’s tastes. 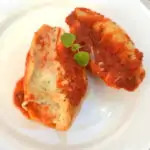 I love keeping this recipe simple and keep the focus on the flavors of the cheeses and the sauce. Plus, I enjoy serving meatless dishes whenever I can. If you need a little something more than just cheese, try omitting a bit of the ricotta and adding in one of your favorite flavors. Fresh chopped broccoli, spinach, mushrooms, peppers, browned ground beef, crab meat, crisp bacon – whatever your taste buds prefer. This dinner takes about 45 minutes to get on the table – most of that time being cooking time. It’s simple to make and really doesn’t involve much hands on time. 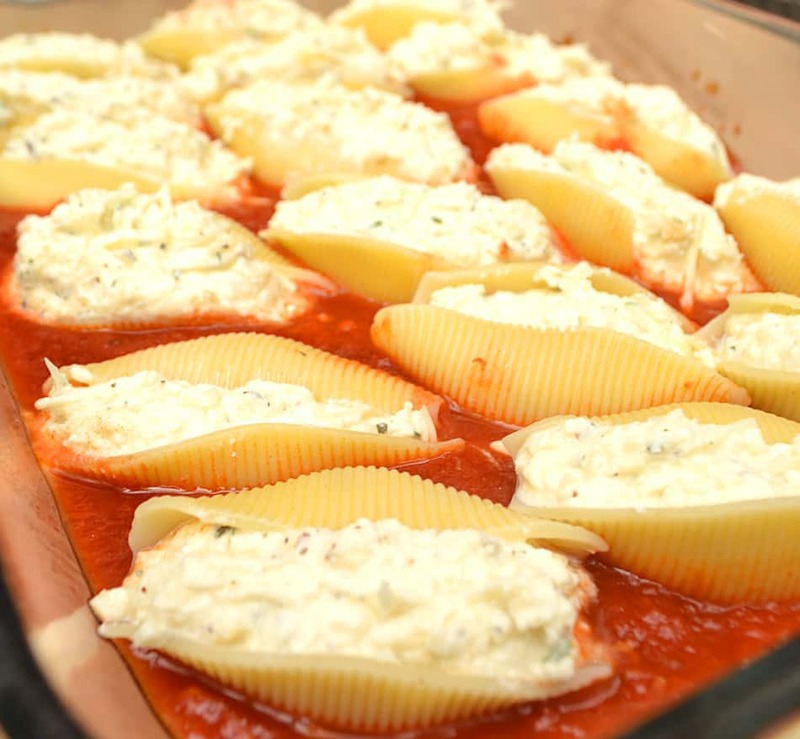 Serve these Stuffed Shells with a salad & bread and dinner is complete. This makes quite a bit of food & is very filling, so expect some leftovers. Yay! Want more? Visit for recipes, ideas, inspiration, essentials, prep skills & the beauty of The Tuscan Way. Mix together ricotta cheese, mozzarella cheese, 3/4 cup Parmesan cheese, eggs, parsley, oregano, basil, salt, garlic powder & black pepper. Set aside. Cook pasta in salted water until al' dente. Drain. Pour 1 jar of sauce in a lightly greased 13x9 baking dish. 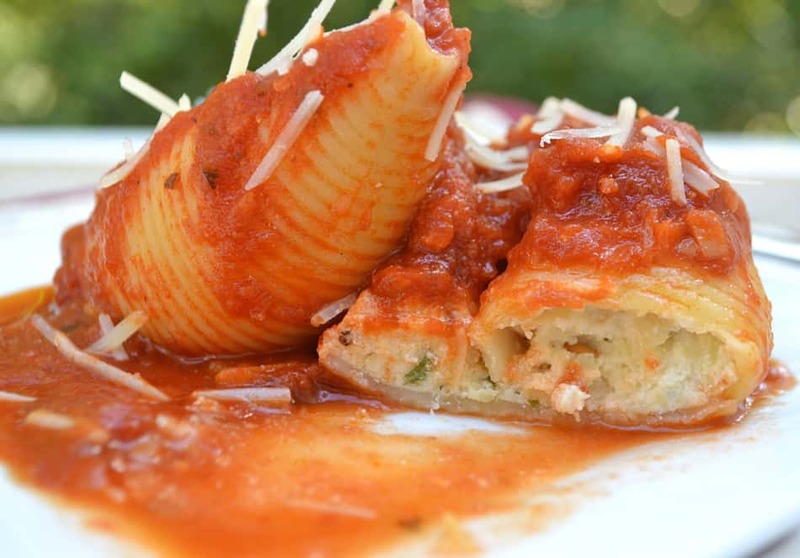 Fill each shell with cheese mixture. Place shell in dish on top of sauce - seam side up. Continue with all shells. When dish is full, create a second layer. 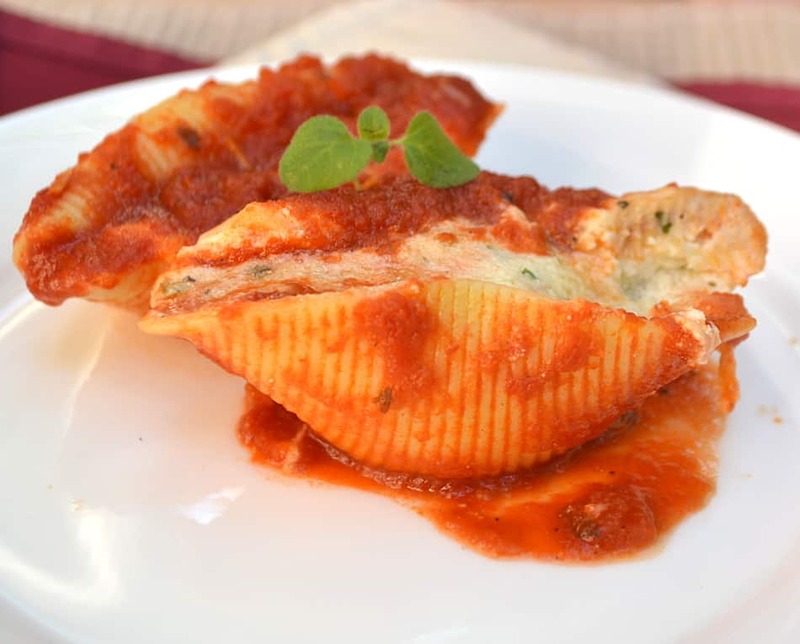 You can spread a spoonful of sauce over bottom layer of shells to prevent sticking. Pour remainder of second jar of sauce over shells. Sprinkle with 1/4 cup Parmesan cheese. Cover with aluminum foil and bake for about 30 - 35 minutes. I love simple dishes too. I love these stuff shells. Good stuff!! What is a serving size considered? Hi Michelle. Now that I’m thinking about it – perhaps I should up the serving amount to 6-8 servings…. There’s roughly 35 shells in a box – but I’m guessing that only 24 – 28 shells actually got stuffed. There’s always quite a few broken shells & shells that don’t survive the boiling water. So I’m thinking 3-4 shells per serving. They definitely are filling. I have frozen stuffed shells before and defrosted and baked them covered…turned out perfect. I have not tried this recipe but one with meat and cheese stuffing. My husband loves this recipe. So has everyone I have served it to. I have a family of 5 and I make 2 boxes. I double the entire recipe and we eat it for dinner and have the rest within 2days and there is plenty!! And they are all boys but me!!! 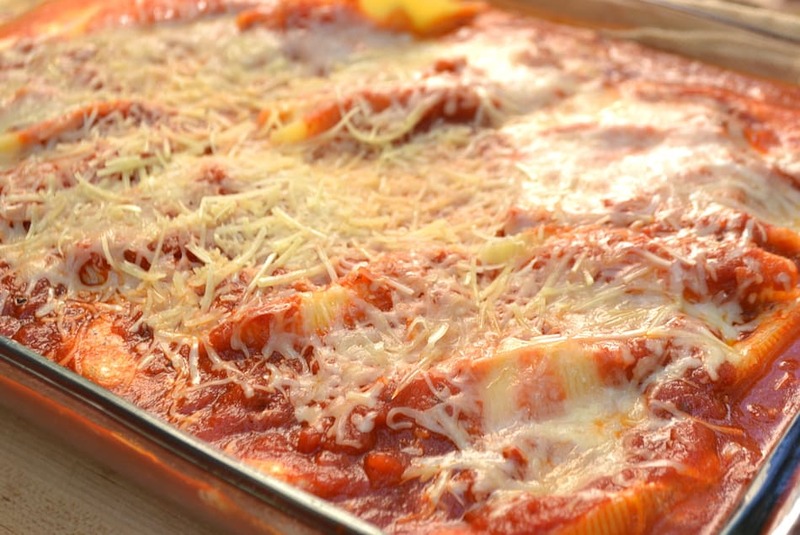 It was very easy to prepare and my family loved this dish! So glad to hear you all enjoyed the recipe! Yup – you can make the whole recipe ahead of time and bake when ready. Tried many recipes but this is by far my favorite, so good the friends that we’re here requested more LOL so here I am making another batch of 60!!! So glad you enjoyed John! I have used a very similar recipe fr years, I have found if I use a sell amount of nutmeg in the filling it gets WOW from all my guests I have served it to. It just. Gives t a different flavor snd folks love it. I always use a fresh marinara dude too. I LOVE this recipe! I double it to feed everyone! The only difference is I use the new Bertolli Rustic Cuts and get 2 of the marinara and 2 of the sweet peppers ! I have 3 adults, a teenager and his friends, an 8yr old and myself with that version (the 3 mo old sits and stares while drinking his bottle lol as if to say I CNT wait til I can eat it lol) its amazing!!! Yay! So glad you & your family enjoy the Stuffed Shells. Oh girl….this looks like such a great family dinner! I love cooking at home and eating as a family. So important! Pinned!! Pasta is always a family favorite. Who could resist all that cheese??? I am planning on making this for my son’s birthday meal this weekend. Since we will have meal after church, I will prepare Saturday evening and bake when I get home. I will let you know how they like it. You are my neighbor almost, since I live in York County, PA. Thanks! Delicious. Made double this recipe to feed 10, and we easily had 1/3 left over even after stuffing ourselves. I made these Christmas Eve for the non-gf crowd and they were a hit!